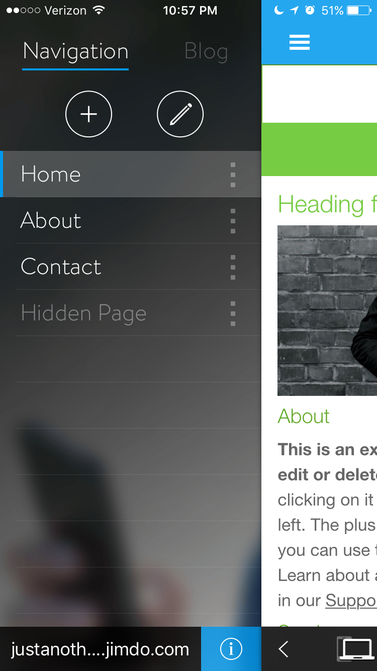 Jimdo's mobile apps for iOS and Android make it possible to edit your website on-the-go. Both apps are free—you can download the iOS app in the Apple App Store and the Android app in the Google Play Store. Keep reading to learn about creating pages, adding and editing content, writing blog posts, and using the many other features of the app. Upon opening the app for the first time, you will be greeted with two options: Create a Website, and Log In. If you don't have a website just yet, click Create a Website, choose a template, enter a website name, enter your email address, and choose a password. If you already own a website, choose the Log In option and enter the name of your website. This can be your own domain (www.yoursite.com), or your Jimdo URL (yoursite.jimdo.com). Once you log in, the app will save your password so that you don't have to enter it in every time you want to work on your site. There are two ways to modify your navigation to add new pages, delete them, or edit them: you can swipe from the center to the right, or you can tap the icon on the top left. This will open up the options on the left side to reveal your current navigation. To add a new page, tap the + icon and enter the name of the page. Tapping the three dots next to the name of a page will allow you to add a new page under that specific page, hide it, indent it, or delete it in the case of Android. Tapping the pencil icon opens up a few more options. Tap the name of a page to change it. To rearrange the order of the pages, grab the handle and move it where you would like it to go. On iOS, tap the red icon next to the name of a page to delete it. Tap the check mark to confirm your changes. Aside from adding regular pages, you can also manage your blog through the app. Tap the Blog tab at the top of this section to see your current blog posts. Tap the + icon to start a new post. Choose the name, add categories, and add a few more options. Click save to continue and to start crafting your post. Once your blog post is ready to be published, tap the Blog icon, tap the name of the post, and choose the Publish option. Working with content on the mobile app works in the same was as it does on the desktop version; tap the content to make any changes, and click the blue + button to add new elements. Swiping from the center to the left or tapping the icon on the top right lets you edit your elements. You can add a new element from here by tapping the + icon, or you can edit elements by tapping the pencil icon. That will allow you to rearrange elements by using the handles, or to delete them by tapping the red icon on iOS. You can delete elements on Android by swiping the element to the left. With the Heading Element, you can enter a heading in three different sizes. Add a large heading at the top of each page to guide your site visitors and to help with SEO. To make any changes to your content, tap the Save button on the top right (iOS) or the checkmark (Android). 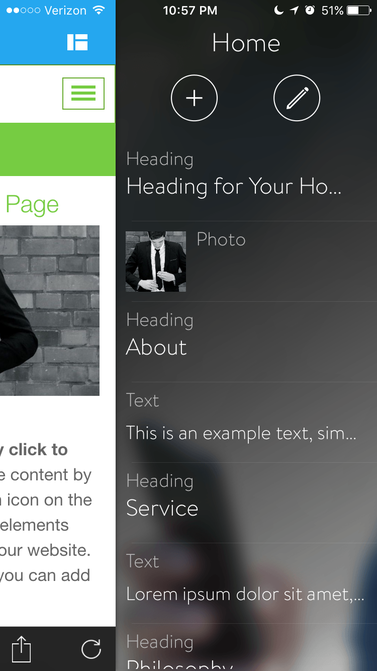 When working with the Text Element, a new view will open up, allowing you to see a lot of your content. To bold, italicize, or to add text links, tap a word or phrase, select it (use the handles to select more text), and then tap the "T" underneath. This is a compact version of the text editor on the desktop version. The Photo and Photo Gallery Elements are great for adding images to your site. Take advantage of your mobile device's built-in camera to add a photo as an event is happening, or choose one from your gallery. Preview your site: On iOS, tap the icon in the main view at the bottom that looks like a computer and a mobile phone to see what your site will look like on those devices. On Android, tap the phone icon at the top. Change your template: If you're using iOS, tap the icon with the three circles at the top of the app. Android users can tap the menu icon on the left side at the top of the app, then select the icon of the three tags which are located in the top right of this menu. iOS: Tap the graph icon at the top of the screen. Note that you will need to activate this feature through the desktop version first. Android: Jimdo's Android app includes a statistics widget that you can add to one of your device's home screens. Find your app version: Go into the navigation options by swiping from the center to the right or tapping the icon on the top left, and then by tapping the information ("i") icon. The app version will be listed at the bottom. Logging out of your site: Tap the Logout button to log out of your site. It is only possible to be logged in to one site at a time on the mobile apps. Note: Not every feature on the desktop version is available on the app just yet. 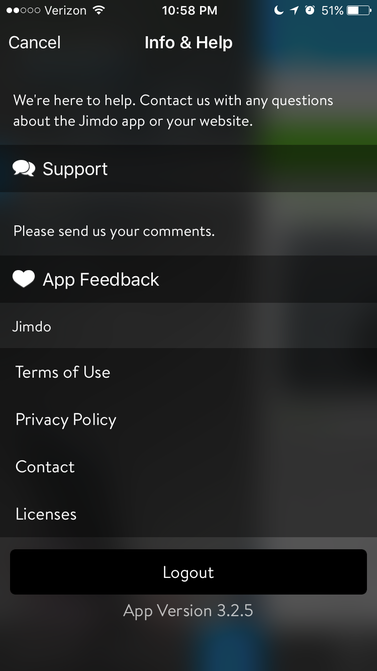 You can access any website built with the Jimdo Mobile App on your computer to use all features like the full list of elements.